Prior to going to Halong Bay, I decided to head to Tam Coc, Ninh Binh, a little south of Hanoi before heading to Hue. The stories and photos of the river and the limestone mountains surrounding it made me think about Li River in China and how I’ve always wanted to go there. But after an overnight tour of Halong Bay and my little disappointment over it, probably because of the fog and rainy weather, I decided to skip it all together and just take the sleeper bus to Hue. And I had no idea that this last minute decision will give me one of the most wonderful surprises of the Big Trip. Around 5pm, a van picked me up from Hanoi Hostel. The van was almost filled, there were two guys behind me, and a group of young Singaporeans at the back. I even made a corny joke saying ‘I hope this is not the sleeper bus to Hue.’ The two guys behind me had no reaction whatsoever. Luckily, the Singaporeans laughed and said that they’re hoping for the same thing. A few minutes later, the last passengers of our ride were picked up, two girls who got seated at the front. When we got out of the Old Quarter, the van suddenly stopped on the side of the road. Asked all of us to go down and looked at our tickets. This was when the girls and I noticed that we had the same tickets. I felt relieved. But for some reason, they, along with the Singaporeans were asked to go to the travel agency by the road. And I, along with the two other guys and some locals who were also waiting by the road, were asked to ride a taxi. The girls and I asked the driver why we were being separated, but he just shrugged us off. I felt so confused. I was the first to get inside the taxi, then one of the guys sat beside me. Eager to know if we had the same ticket, I asked him ‘Are you also going to Hue?’ And that’s where our story started, as you probably read from my previous travel entries. He was travelling with his friend throughout Southeast Asia. Vietnam was their first stop. We talked about the countries we’ve visited, I talked a lot about India and Nepal, while he on his trip to South America. We both quit our jobs to travel. I had no idea I'd be traveling with him for the rest of the Big Trip. The ride to Hue was long and it was my first time to ride a sleeper bus. The size of the bus was just right, with three rows and two levels of small beds. Since we were the last ones to go inside the bus, we were left with the unwanted beds. Mine was at the middle row and top level, and near the smelly toilet. Good thing there were bus stops along the way. After almost 11 hours, we arrived in Hue. 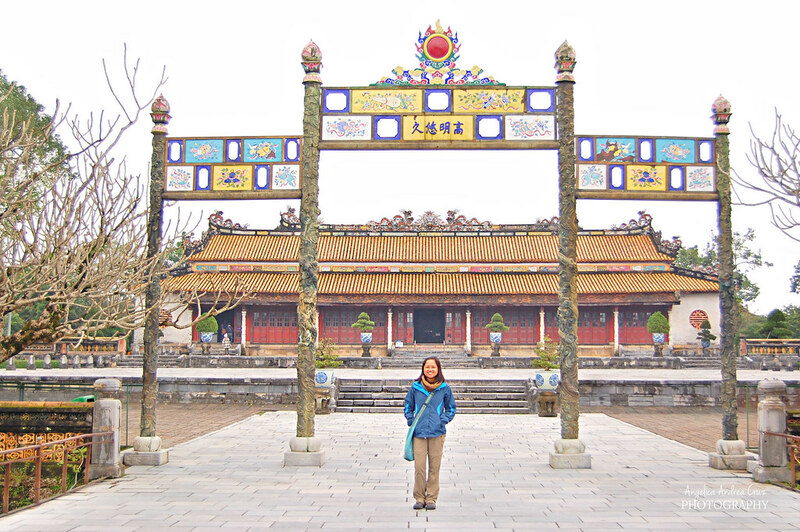 Hue is famous for being the former capital of Vietnam or the Nguyen dynasty. A lot of people I met who've been to Vietnam said I should skip Hue and just head straight to Hoi An. But I decided to take it slow and make a stop in Hue. After reading about how it's known as a good place for walking especially inside the Citadel, I thought a two-day break wouldn't hurt. Ready to travel and explore the city solo again, I brought out my LP guide to look for a cheap hostel and locate it on the map. It was a little bit cold and a bit cloudy, it was the perfect weather for a morning walk. But Anthony and his friend were waiting for me. We decided to look for a cheap hostel together along with a couple we also met during the bus ride. After settling in and having breakfast, we went to see the Citadel. The Citadel is what most people go to Hue for. It used to house the imperial seat of government. Inside is a huge complex of temples, museums, and galleries. More than anything I loved how peaceful it was inside. Afterwards, we went to a small mall, the first one since that mall in New Delhi. It was December and people were shopping for Christmas gifts. We even took a photo by the giant Christmas tree. Back in the hostel, Anthony and I continued our talks and went on our ‘first date’. I said I wanted to eat pho by the street. And that made him so happy, it was going to be his first street-side meal in Vietnam. He told me how his friend is still adjusting to the Southeast Asian street food which was why they would always eat at restaurants. It was a good first date capped off by a few drinks at a bar dancing with other backpackers. The next day we decided to visit some of the monasteries outside the city. And Anthony and his friend rented motorbikes. And I was so excited. I regretted not riding a motorbike when my friends and I went to Saigon back in 2008. And thanks to Anthony, most of our independent tours in Vietnam, Thailand, and Laos were on a motorbike. Next stop was a park we saw on the way to the countryside. With the fog, the cold weather, and the pine trees, I was reminded again by my hometown Baguio City. A few people were jogging and brisk walking around the park, couples cuddling, and others who were just there to relax and breathe the fresh air. With only the ripped-off page of Hue’s map from my fake LP Guide, we went farther out of the city and into the country side of Hue. It was around mid-afternoon and children just got out of their schools. I loved how they just effortlessly and leisurely rode their bikes, talking and laughing, like they were just walking. Being the newbie biker that I was, I was so envious of them. But more than that, this scene that I will also see in Hoi An and Mui Ne, was a signature scene of the simple and laidback life of rural Vietnam. After almost half an hour, we made it to the monastery. It was beautiful inside. It was located off the road, and inside a forest. The small arc partially covered by a tree was ironically welcoming. Inside at the center was a small lake and a fountain. Young monks with mohawks walked with us into the temple area. We went there at the perfect hour as the monks were just starting their prayers. With bells ringing, monks chanting, and incense burning, I was so happy to have finally witnessed monks praying. We were not so lucky in India. The Pagoda also serves as a cemetery for the monks that have passed away. On top of their tombs were these big rocks shaped like the shell of a turtle. The monk leaders were farther up into the forest and are kept inside a small area. It was already getting dark and so I decided to look for the guys. I found Anthony playing football with the young monks. They were barefoot and just enjoying themselves.